In medium bowl, mix cream cheese and marshmallow crème. Divide cream cheese mixture among tortillas, spreading evenly over tortillas, leaving 1/2-inch border. Top half of each tortilla with strawberries and kiwifruit. Top with coconut. 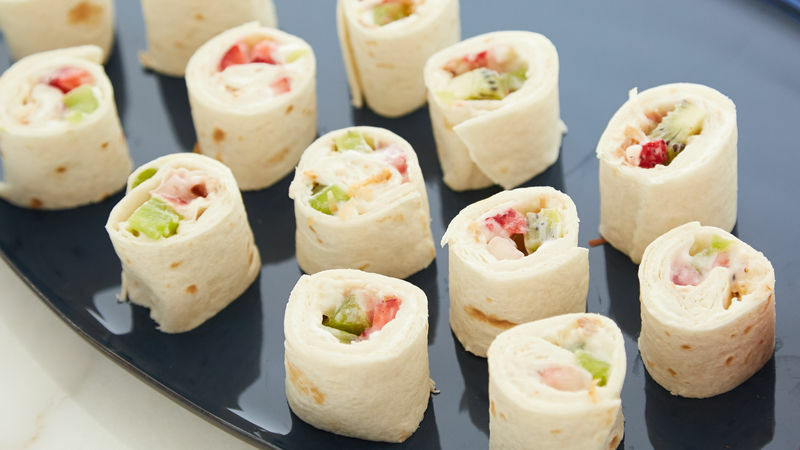 Starting from side with toppings, roll up very tightly. Wrap with plastic wrap. Refrigerate at least 2 hours but no longer than 3 hours. To serve, cut 1 inch from end of each roll, and discard. Cut each roll into 4 (1 1/2-inch) slices. Sprinkle with powdered sugar. For an extra-decadent treat, serve with chocolate sauce for dipping. To peel kiwifruit easily, slice off top and bottom of fruit, and slide large spoon between skin and flesh, and turn to separate.